One more way to cheat in blackjack is card bending. Actually, bending is practically the same with card marking and sometimes it is considered to be the easiest way to perform this act. Here a cheater marks a card by crimping for example. Card bending is very popular among cheaters. That is why each time before game starts, dealer checks cards to be sure they are in good condition to play and there are no marks on them. What to do if I play at home? Playing at home with your friends and people whom you trust will not protect you from this type of cheating. 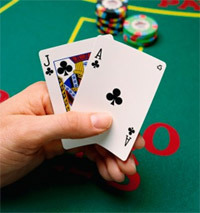 Even more, playing outside casino walls make people cheat more frequently. Moreover, it makes game interesting and a little bit more complicated for winning. Are there any other ways to protect from bending? Some people like playing at home without going to any casino. They gather with friends (and not only), make bets and play blackjack or bingo in a quiet atmosphere. How to protect yourself from being cheated? Just be very careful and pay attention towards how a shoe is shuffled. And do not forget to notice and watch how a person handles the cards. Do not give cheaters a chance to bend cards. Bending is a very old way of blackjack cheating and maybe even one of the first ones. Cheating was born together with card games as people always tried to do something for an easier winning. Bending was the first variant of card marking and it used to take place before cheaters began using other methods, like inks, alcohol spots, scratches and so ones. Today a lot of magicians use card bending during their shows. They do it mentally (at least they want to persuade us in this). Many videos can be found on this topic and, unfortunately, these videos can be a good educational material for players who try to become good cheaters.